RUDN chemists have developed a new method for obtaining titanium-based nanoparticles to clean water from phenols—toxic aromatic hydrocarbons with an OH-group. The atoms of metals in the nanoparticles oxidize the pollutants under the influence of light and turn them into water and carbon dioxide. The new method will make the production of such nanoparticles easier and cheaper. The results of the work were published in the Journal of Molecular Liquids. Phenols are toxic chemical compounds used in the manufacture of rubber, plastic, fuel, pesticides, and other substances. Phenol releases are among the most common causes of natural water pollution and the death of aquatic fauna. Phenol suppresses plant growth, causes respiratory distress in animals and reduces their mobility. Self-purification of water bodies from phenols takes time, and the toxic compound spreads further due to currents. RUDN chemists found a new way to neutralize damaging phenol releases using the nanoparticles of titanate salts. Besides titanium and oxygen, they contain the atoms of metals (e.g. magnesium, chrome, or cobalt) that can accept and release electrons in the phenols oxidation reaction under the influence of light. As a result of oxidation, phenols turn into water and carbon dioxide. The authors of the work suggested synthesizing these nanoparticles on the basis of titanium butoxide (organic titanium oxide) and metal salts in the presence of an organic solvent. 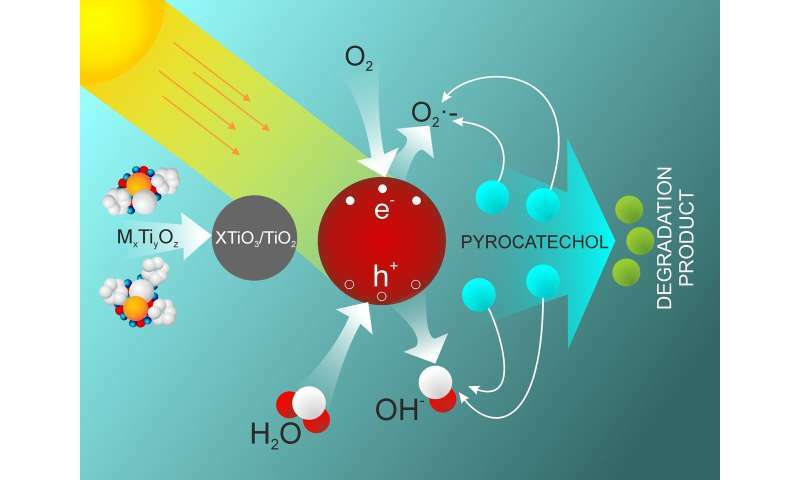 "Photocatalysts are of specific interest for us as water purifying agents. They accelerate the disintegration of dangerous substances under light, including visible light. The end products of such a reaction are water and carbon dioxide that are completely save for the environment. In our work, we've described a new method of synthesizing the nanoparticles that oxidize phenols under the influence of light, quickly and at relatively low temperatures," said Yahua Absalan, a post-graduate of the Department of General Chemistry at the Faculty of Physics, Mathematics, and Natural Sciences, RUDN. In experiments with varying temperatures, the reaction showed its highest speed (3.5 hours) at 550 degrees С. Previously, obtaining nanoparticles like these required temperatures around 750 degrees С. The new method is less energy-consuming and therefore makes the production of titanium nanoparticles cheaper. "Metal titanates in the form of nanoparticles can act as effective photocatalysts, accelerating the disintegration of dangerous substances in industrial emissions. Previously, we synthesized them at 750 degrees С using expensive and complex equipment. The improved methodology will make the production of nanoparticles more affordable," concluded Yahua Absalan. RUDN chemists tested the efficiency of the obtained nanoparticles by adding pyrocatechol (a phenolic compound) to them. Under the influence of light, titanium nanoparticles destroyed the molecules of this dangerous substance. The nanoparticles containing erbium showed the best results—around 84 percent disintegrated after irradiation with visible light. The nanoparticles demonstrated high stability: one dose could be used four times without any changes in efficiency. Later on, the structure of the nanoparticles altered, and their efficiency reduced.